Retired Brigadier General Dan Cherry shares with Warbird Digest readers how he became part of a group that rescued his MiG killer F-4 from anuncertain fate. 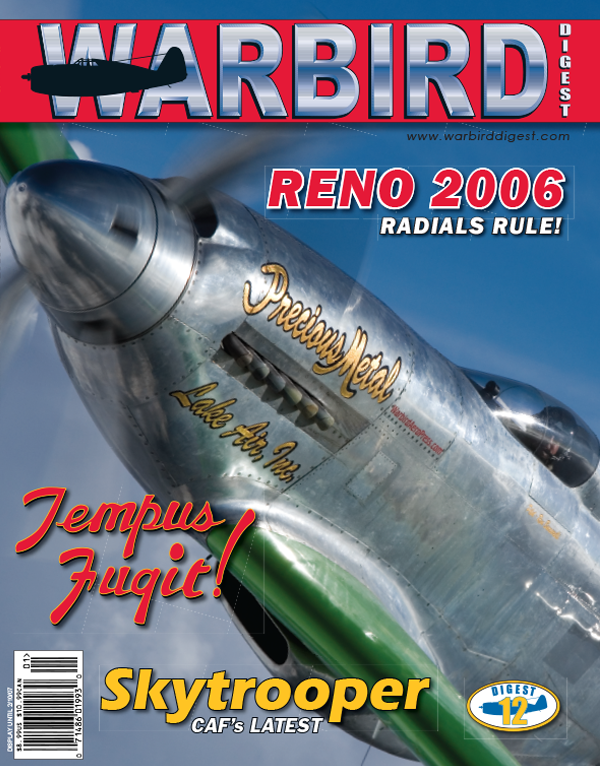 Scott Germain reports on Reno 2006 where the attrition rate was high, especially among the Merlin powered racers. The Commemorative Air Force has added another flying warbird to its impressive fleet. The Inland Empire Wing has produced a magnificent recreation in memory of those who jumped out into the dark skies over Normandy more than sixty years ago. The National Museum of the United States Air Force opened its doors and runway to a group of Liaison aircraft owners recently. This unique but underattended event will certainly grow in popularity as the word spreads. Greg Morehead visited with the L-bird pilots and brings our readers the story. The Cessna L-19/O-1 Birddog series of aircraft are very popular within the warbird community for their great flying characteristics and reasonable cost. Beyond those two attributes, the type has an incredible combat history. This is especially true for Randy Maiville’s O-1G, the only G-model flying in the United States. Rare Bear didn’t make the race this year after declaring a mayday shortly after its qualifying run. The remainder of the race week, the airplane was the subject of a great number of rumors. Scott Germain went to those in the know to get the straight scoop. When Square One Aviation closed its doors after the death of its owner in 2004, a number of Mustang projects faced an uncertain future. Fortunately, one owner decided to keep the Square One team together to finish his TF-51. Warbird Digest’s Doug Fisher captured the finished product as it left the paint shop. In just a few weeks the hardworking employees of Midwest Texans, Warbird Digest’s sister company, repaired and returned a veteran racer to the pylons. Tim Savage describes that effort and what it was like to field a rookie team at Reno 2006.